Up to 1,148 London schools are within 150m (492ft) of roads carrying about 10,000 vehicles a day, putting pupils' health at risk, a campaign group said. Figures obtained by Clean Air in London (CAL) found in total 2,270 schools are within 400m (1,312ft) of such roads. Exposure to such levels of pollution could lead to 15% to 30% of new cases of asthma in children, CAL said. 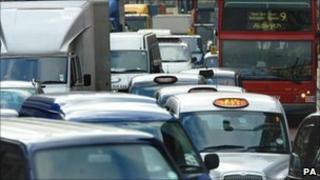 Mayor Boris Johnson's spokesman said: "Road pollution is a serious health issue for Londoners of all ages." CAL obtained the figures through a Freedom of Information request from Transport for London. CAL said a research project called Aphekom - which investigated air pollution in Europe - found people living near roads travelled by 10,000 or more vehicles a day on average were vulnerable to heart diseases, and the pollution could be responsible for 15% to 30% of all new cases of asthma in children. Aphekom was a three-year project involving 60 scientists, which studied issues relating to air pollution and health in 25 cities in 12 countries across Europe. Simon Birkett, director of CAL, said: "The government and mayor Johnson must tackle an invisible public health crisis harming as many people now as we thought during the Great Smog in December 1952. "We need one or more additional inner low emission zones that ban the oldest diesel vehicles from our most polluted roads, and a massive campaign to build public understanding of the dangers of air pollution with advice on how people can protect themselves." London Assembly Green Party member Darren Johnson said: "The Mayor should work with local authorities to create a system which immediately notifies these schools of high pollution episodes, so that parents and teachers are made aware of potential health problems on days when pollution is at its worst." Kulveer Ranger, the mayor's director for the environment, said: "Transport for London has worked with more than 3,000 schools to help cut pollution. "The mayor is also working to curb unnecessary engine idling, often an issue outside schools, and will be working with boroughs to raise awareness of how drivers in the capital can help to reduce dangerous emissions through smarter driving." The administration was also taking "tough measures" such as removing old cabs from the roads, investing in cleaner buses, cycling and tightening the standards to the Low Emission Zone, he said. CAL has submitted a report on air pollution to Parliament's Environmental Audit Committee inquiry on air quality in May. The European Commission has given London's mayor and the UK government until this month to come up with a "London action plan" to ensure compliance with the air pollution limits, failing which it could refer the breach to the European Court of Justice. The most hated stretch of road in the UK?